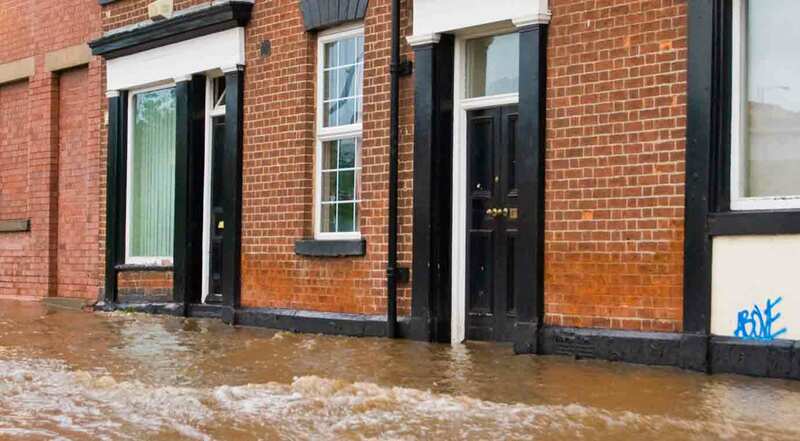 Flood damage is becoming an increasing reality for many property owners in the UK. According to an Environment Agency report, more than 5.2 million properties are at risk of flooding in England alone (Flooding in England: A National Assesment of Flood Risk, Page 6). Flood damage repairs to unprepared homes can be costly, time consuming and extremely stressful. The goal of a flood resistance system is to stop water from entering the property, thereby protecting the interior from damage. This kind of system is best used where repeated renovation or cleansing of the interior after multiple floods is not practical or desired. 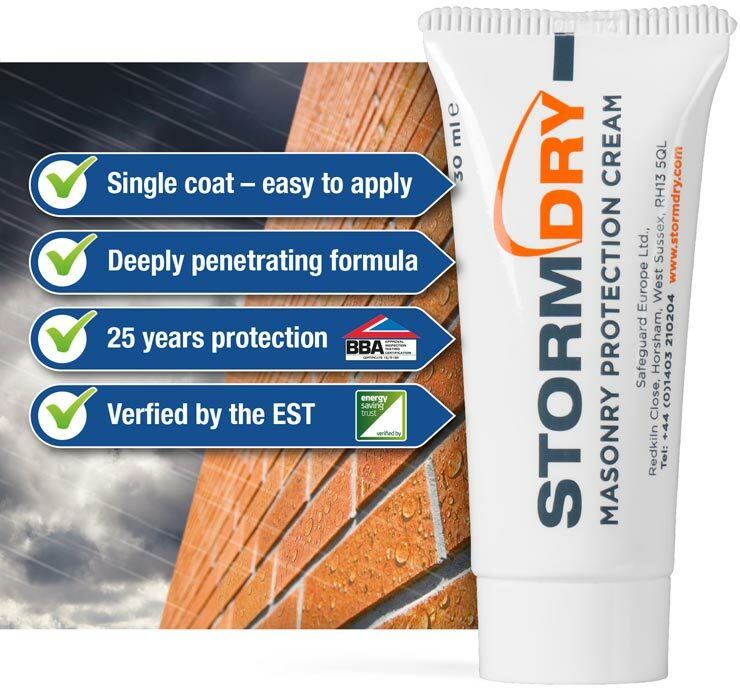 Stormdry Masonry Protection Cream, applied to a wall that has been recently repointed using Stormdry Repointing Additive No.2, can seal the exterior walls of a property from water penetration. This provides protection from flood water up to the government recommended flood resistance design height of 600mm (Planning Policy Statement 25, Page 149, Figure 6.2). Any flood water of greater height than the guideline of 600mm must be allowed to enter the property, to alleviate water pressure and preserve the building’s structural integrity. 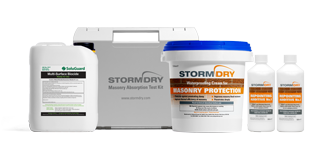 Stormdry has shown in tests to effectively eliminate water penetration up to these levels. The installation of a chemical DPC at maximum flood design height using Dryzone to stop water tracking up, through capillary action. Interior tanking, using Drybase or the Vandex range, to stop water penetration through the floor. The installation of flood gates on the windows and doors and the sealing of any service penetrations, such as cable ducts or airbricks. It should also be noted that if the property is subject to risk of flooding above 600mm or there are structural concerns then a resilience system should be considered as an alternative. The goal of a flood resilience system is to allow a building to partially or fully flood but manage the construction of the interior in such a way that damage and recovery time is greatly reduced. This type of system would be a consideration if the property in question is subject to risk of floods that are either above the recommended 600mm height or where water flow rates present the building with a threat of structural damage. 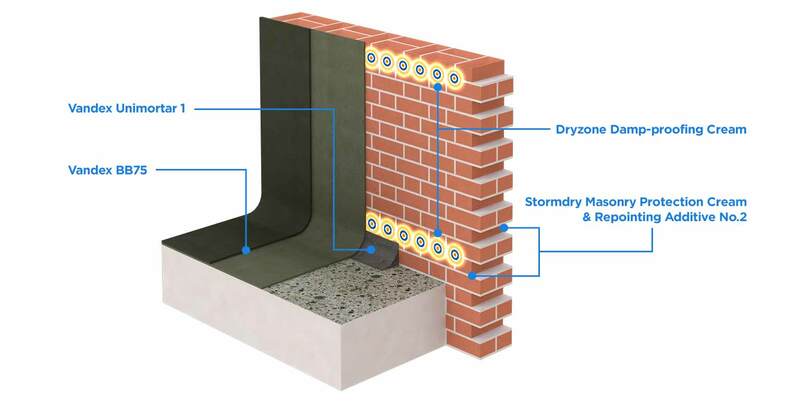 In this type of approach to flood protection, Stormdry is used to offer the primary resistance to water penetration through the wall, reducing the saturation of masonry during the initial flood and making the drying time significantly shorter afterwards. The purpose of Stormdry in this instance is not to stop flood water from entering the property but to limit damage and aid speedy restoration. After a property has been flooded, the amount of time it takes a building to dry out can take months, especially if wind and rain penetrates already saturated masonry. 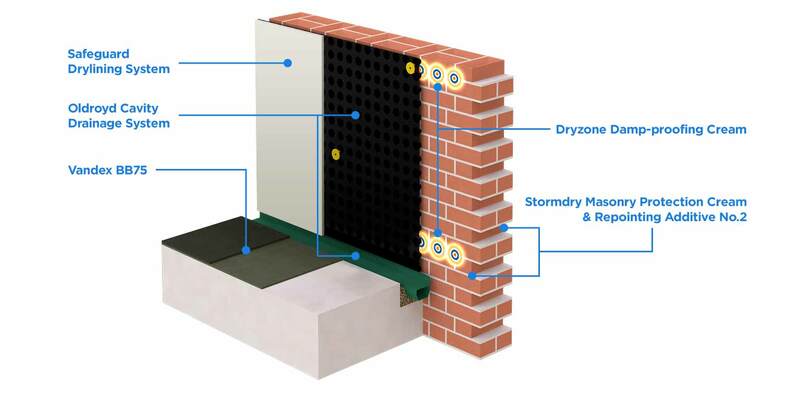 If the masonry is treated with Stormdry, which is breathable, then both initial protection and post flood recovery are aided, meaning there is less chance of complications like dry rot and reduced insulation efficiency. The installation of correct drainage and pump systems along the walls and floor, to manage water flow, incorporating Oldroyd Cavity Drainage Membranes, Aquadrain Channels and Sentry Pump & Sump systems. The fitting of a Safeguard Fast Frame dry lining system, up to or above the flood design height, to ensure efficient change/repair of damaged décor. This works specifically with Oldroyd products and plasterboard. The use of easy to clean surfaces, where possible, such as tiles. In cases where this is not possible, use materials that are as easy to replace as possible. It is important to consult experts before deciding which type of solution you want to pursue. For a more detailed look at the technical methods of protecting your property from flood damage, visit www.safeguardeurope.com. You can also contact our expert technical advisors for specific advice and referrals by calling 01403 210204. Government guidelines and independent information can be found in the links below.